Steve McQueen, Remember Me (detail), 2016. Acrylic paint on 77 neon borosilicate tubes, 19 5/8 to 39 5/16 inches, 3/16 to 3/8 inch diameter. Courtesy the artist and Marian Goodman Gallery. Photo: Rebecca Fanuele. Marian Goodman Gallery in Paris is proud to announce an exhibition by Steve McQueen to launch the 2016 season. We present Ashes, his latest film installation, as well as several new works produced especially for this, his fifth exhibition at the gallery. 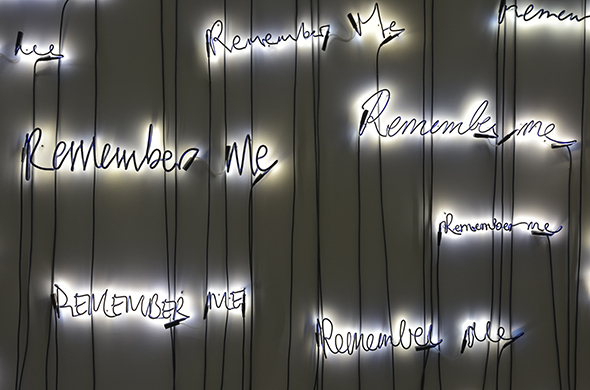 Steve McQueen’s latest projects comprise a wall installation formed of 77 dark blue neon lights, each a unique handwritten version of the phrase Remember Me, as well as two sculptural works, Broken Column and Moonlit. Ashes is an immersive work composed of two films projected simultaneously on either side of a free-hanging screen. First is a portrait of Ashes, a young man from Grenada from where the artist’s family also originated. Cracking a mischievous smile and taunting the camera, Ashes is seated at the prow of a boat sailing the Caribbean Sea. The footage was captured during the production of another work, titled Caribs’ Leap (2002). Shot live on Super 8 film by the renowned cinematographer Robby Müller, the images illustrate the documentary aspect of McQueen’s work. The intensity of the piece is derived from the juxtaposition of the two projections (life and death, boundless space and enclosed space) linked by an off-screen voice. McQueen uses a monologue to pull together the threads of a story that are absent from the images. Employing this narrative device, each viewer is rendered a witness to the drama through the oral testimonies of Ashes’s friends. Born in London in 1969, Steve McQueen has said “I discovered filmmaking, and that was it, a eureka moment. I was 19 years old.” In 1993, as he was about to graduate from Goldsmiths, University of London, he showed his first video, Bear, at the Royal College of Art in London. This first video revealed some of the themes that the artist continued to explore in the 1990s, such as the relationship of the body to space. His work was recognized in 1999 when he was awarded the Turner Prize. McQueen’s work has been the subject of many museums around the world, including the National Portrait Gallery in London (2010), the De Pont Museum of Contemporary Art in Tilburg (2009), the Institute of Contemporary Art in London, and the Museum of Modern Art in New York (1997). In 2009, he was selected to represent Great Britain at the Venice Biennale. He participated in Documenta X (1997), Documenta XI (2002), and Documenta XII (2007). Most recently, his work was the subject of retrospective exhibitions, at the Art Institute of Chicago (2012) and at the Schaulager in Basel (2014). His last museum exhibition in France was in 2003 at the Musée d’Art Moderne de la Ville de Paris. The Whitney Museum of American Art in New York will hold a new solo show of his work in spring 2016. Internationally renowned as a filmmaker, McQueen has directed three feature films: Hunger (2008), Shame (2011), and 12 Years a Slave (2014). He won the “camera d’or” award at the Cannes Film Festival for Hunger and the Oscar for the Best Motion Picture for 12 Years a Slave in 2014. For all other enquiries, please contact paris [​at​] mariangoodman.com.